I have sewed practically my whole life, since my first project in 7th grade Home Ec. Jumping in with both feet, my 1st sewing project was a jumper with back zipper, fully lined empire waist bodice (including darts) and set-in cap sleeves. It turned out great, much to the amazement of others who thought I was biting off too much, too soon. I haven’t sewn consistently through-out the remaining 35 years (or so), but I don’t hesitate to pull out the machine when the need arises, even if the project is something I have no background or familiarity with. (Sheer curtain replacement for the vertical blinds? Sure. 12’ x 12’ canvas sun-shade replacement? Why not? ) My M.O. has tended towards – learn by doing, while retaining some expectations of quality. 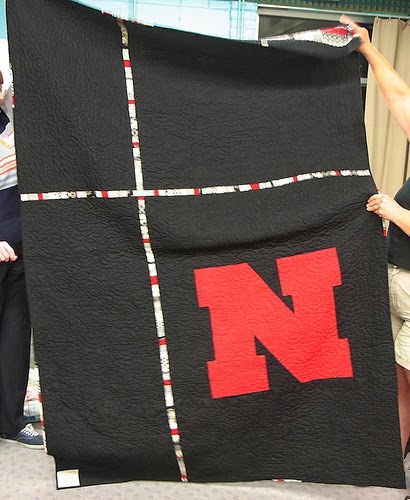 When I was young, my generation of cousins could always count on receiving quilt gifts for major events – high school and college graduation, weddings, babies, etc. These were all made by my Nebraska aunts and hand-quilted by the “bee” gathered at my Aunt Adeline’s house, sitting around the big frame. 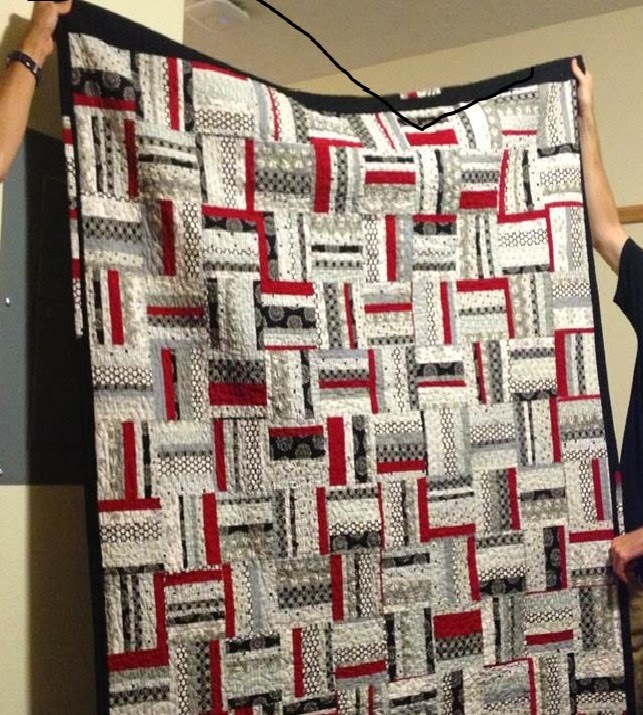 It struck me last spring, during the crazy days before my eldest son’s graduation, that the days of “Auntie” quilts were all over, and if Matt was to have a college dorm quilt, I needed to learn to quilt! I decided to get started in July, choosing to make an easy quilt from strip-sets blocks. One thing I would change for sure about the first quilt…the binding and the seams were “straight” vs. on the bias, and I don’t like that from a “functionality” viewpoint. I worry it won’t wear as well, especially at the seams between all the little pieces. I initially did it straight-grain to use up all the extra sides that had been trimmed off by the long-armer, and for ease of insetting the leftover strip sets into the binding. In the future, I think I will stick with bias binding (see the P.S. for a note on bias binding.) When the quilt was finished, though, I was mainly pleased and thinking…well, other than time-consuming, that wasn’t so bad, and it was fun! So of course I was hooked to do more. And it has been in the “doing more” stages that I’m learning I can’t always just “wing it” as I go. 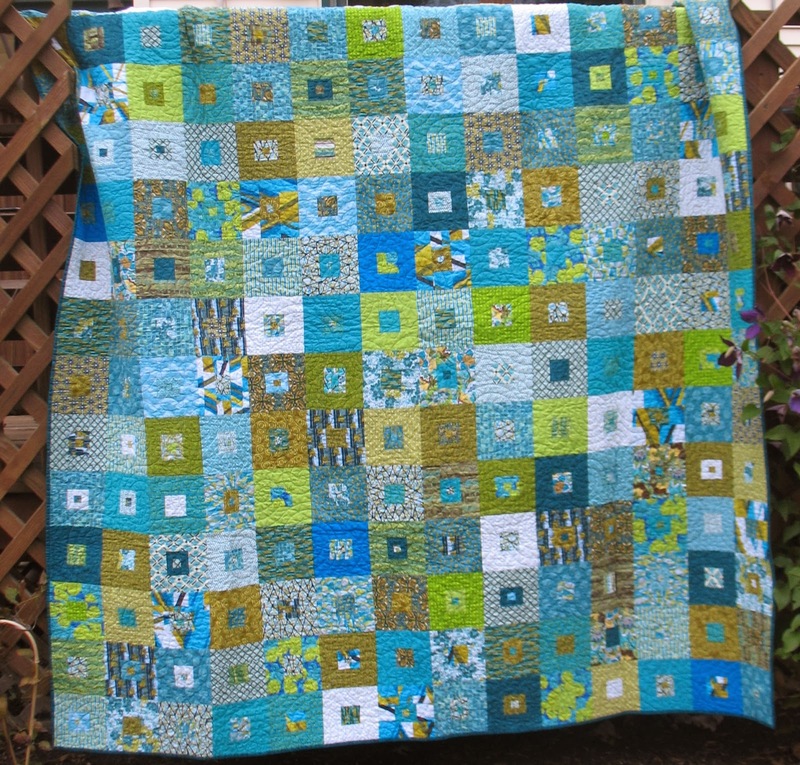 I next undertook a queen size “box in box” green and blue quilt, again just hitting the ground running, and not thoroughly planning it out before I started. This one didn’t go together as easily as the first one – I’d sew blocks together, and realize that one or more fabric pieces were upside down (due directionality), and I’d have to rip the block apart. Or, I’d inadvertently have my needle position in different spot, and end up with 1/4” seams that were just “slightly” different. I was making blocks for weeks, so of course, I’d forget what needle position I had used the previous time…or more accurately, didn’t even think about it because I didn’t realize it would be important. And, of course, I really didn’t realize what was going on until I was trying to lay my rows out, and finding some blocks were just a tish off. I was primarily using stash fabric, and at times, I’d not be happy with the color options available in my stash, and then go out to buy more fabric to add in. In the long run, I re-worked many blocks and made many extra blocks that I didn’t use, simply because I didn’t figure out first exactly what I was doing to begin with. After this quilt, I told myself I needed to spend more time in advance planning, paying attention to the little details, such as noting down what needle position I used for each specific seam and noting fussy-cutting needs or fabric-directionality issues. Not as fun as actually making the quilt, but important to make it go together easier later. 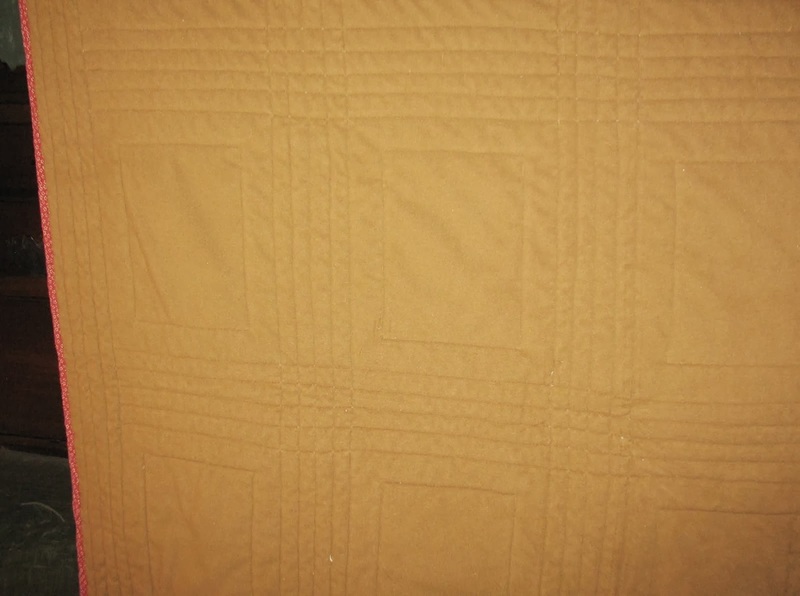 Then came some lap quilts and a baby quilt…all backed with a microfiber fleece. So cuddly! Timing-wise, these projects also coincided with my “long-arming” neighbor absconding from town as a snow-bird. This then became the perfect time to learn to quilt them myself. Through-out this quilting education process, I had been looking at lots and lots of books, but honestly, looking primarily at the pictures. (Who has time to read all the text?) At this point, I did read the parts about layering quilts, as I hadn’t had to do this with the earlier quilts (which were both quilted on a long-arm). For some reason, when I layered the first of the smaller quilts backed with microfiber, I don’t think I taped the backing down. I did both spray and pin it, and then tried to quilt it on the diagonal. It was nothing but frustration for me, as I just couldn’t get the quilting stitches in without wrinkles and catches on the back. This was compounded by tension issues with my machine, given the thickness of the sandwich and that I hadn’t adjusted the tension. Finally, I pulled the stitching out, and did what I should have done to begin with – stretched and taped the back to the floor and then layered and basted it. I also made some sample sandwiches from leftovers, and played with the tension and quilted the sandwiches until I got it right. From there, it was much easier to get good quilting added onto the quilt. It was a good learning experience about both proper layering technique and testing the tension out before sewing on the quilt. I also found out that not all spray basting is as good as 505 spray, highlighting again what my husband always tells me…you have to have the right tools for the job. 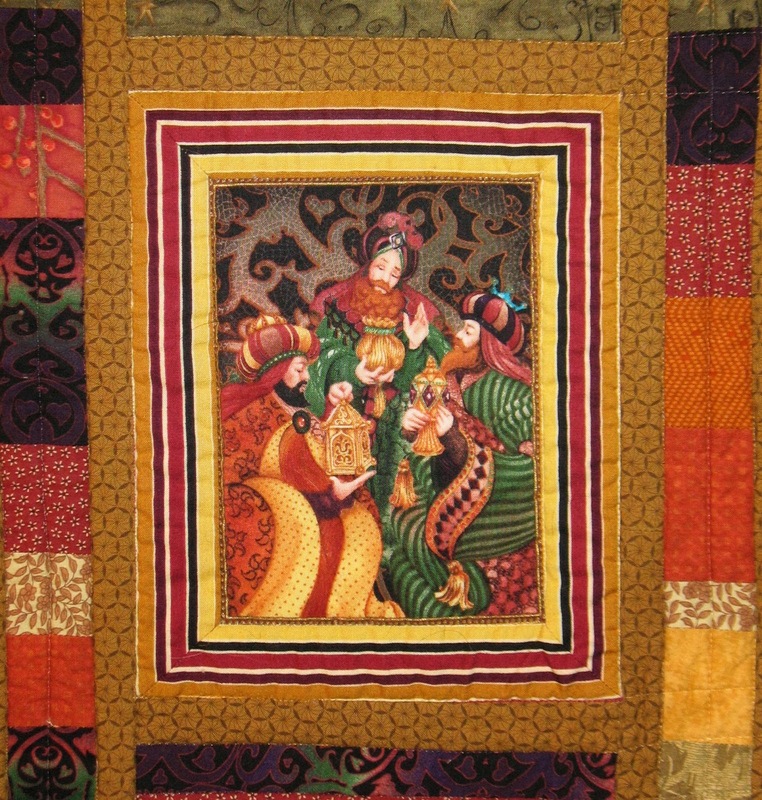 In November and December, I took a couple free-motion quilting classes. These classes were great to *begin* getting me over my fear of free-motion quilting. I learned every teacher has their own opinions on things. I need to try it all, but adopt what seems to work best for me. I learned about how picky thread can be (vertical spool holder or horizontal? ), the importance of fresh needles and regular cleaning of your machine, and I again addressed my tension-adjusting fear (practice, practice, practice). I also learned that a multi-thousand dollar machine (used at class) works really, really well but even it will still need to have tension played with depending on the thread and what’s being quilted. I have learned that it’s going to be very very hard for me to figure out what design to quilt. For the lap quilts that were to be Christmas presents I mainly stuck with straight line stitching or stitch in the ditch or stitching every seam. 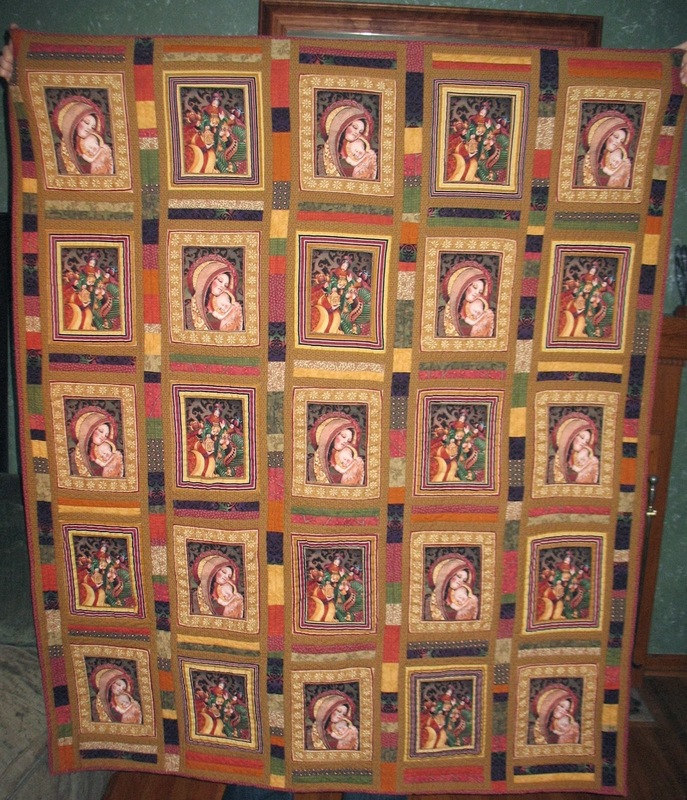 But, on these “stained glass window” quilts I wanted to do something “more” in the window blocks. I couldn’t figure out what to do, and eventually just sent them off with the windows un-quilted. 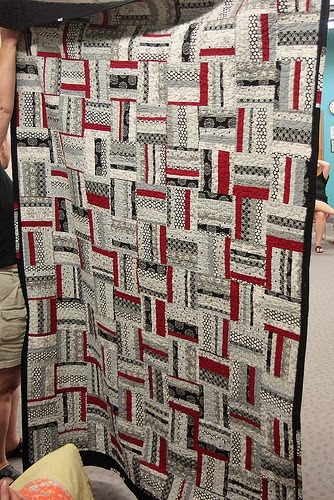 This bothered me, though the batting said the quilting could be that far apart. 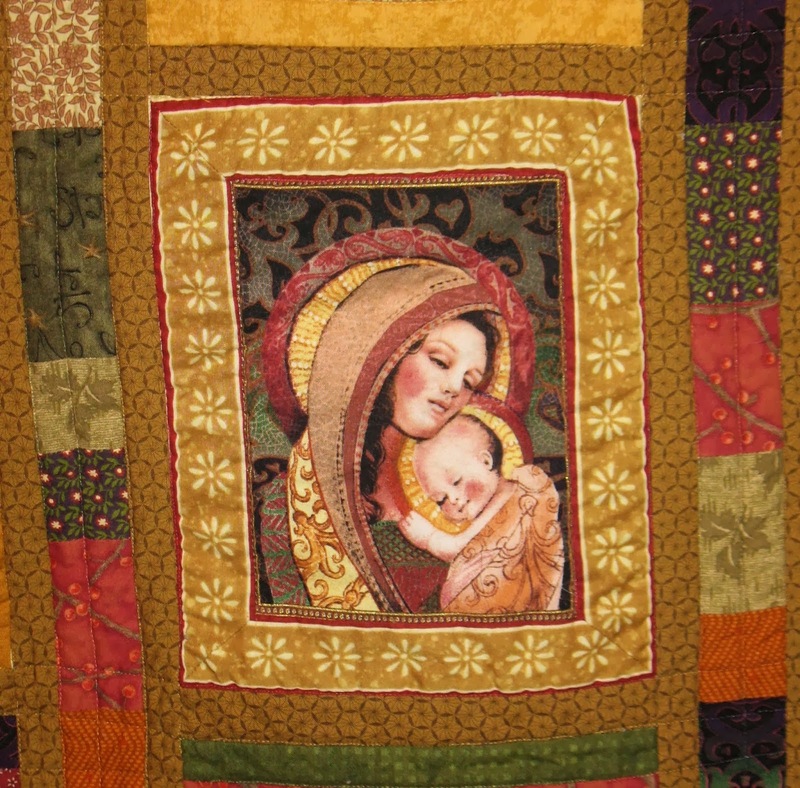 And, it still bothers me, but the recipients don’t care - they aren't sewers, and love their quilts as they are. Since the quilts are seasonal, only in use 1 month of the year, I’m just going to get over it. But I continue to wish I could have figured out a “good” way to add quilting to those windows. Now I’m slowly forging ahead with trying some free-motion quilting. My first attempt was on a lap-quilt for my mother, on very busy fabric. And I used the clear mono-filament thread. Between the mono-filament thread and the busy fabric, the consistency (or lack thereof) of stitch length doesn’t show. Plus, my mom was pleased to have it - because she’s my mom - she just loved that I made it for her. So it was a good learning project for me. I’m now working on a queen-size bed quilt. I had originally planned to quilt the sashing (or trellises, in my mind) with little clusters of ivy from a stencil, but that wasn’t going well. Small little clusters of leaves required too smallof stitches, and for someone just starting free-motion, it was beyond my skill-level. I sought out quilting advice from an experienced professional long-armer who said I needed to do big, free-motion leaves, for 2 reasons. The bigger leaves would be easier for me to free-motion with appropriate stitch length, and I would cover more ground in a faster time. So, home I went to rip out the ivy clusters I had already done, and then to begin again. Even with the classes and other free-motion practice, I’ve still been somewhat intimidated to jump back into FMQing, but I’m happy to report it’s going fairly well. The larger scale leaves are much easier for me to work with (as far as maintaining *some* consistency of stitch size) and the quilting is going much faster than the small ivy leaves went. I am so glad I sought out her advice and followed it, and am now much happier with how the quilting is turning out. While I have learned a few things, I know there is oh so much more to learn going forward. The major learning experience has been that quilting isn’t going to be easy to master. I have learned I need to be patient, patient, patient and plan and practice, ad nauseum, so I can more often get it right without having to re-do things. Though I do expect to continue to re-do things – it’s usually the best way to figure things out (try, and try again). I do think I can save some time, effort, fabric and frustration if I slow down some, do more prep in the planning stage, practice in advance, and make notes so I remember how I was proceeding when next I come to work on the project again. That said, it doesn’t always work… on the little 12x12 quilt I just made for the February exchange, I forgot about the importance of proper pressing to have the blocks “marry up” properly. (This lapse I blame on being distracted by watching a hockey game while sewing , which really should also be on the list of things I’ve learned to NOT do!) I didn’t re-do the pink portion of the quilt, however, as I chose to look at it with the “imperfections add individuality” mind-set. I think it’s a reflection (with the imperfections) of where my skills currently reside, and what I’ve learned, and hope that the recipient can enjoy it anyway! P.S. One last thing I learned - re Figuring fabric needed for bias binding and making the continuous strip. This may be old hat to y'all, but it was news to me and I thought it was cool. 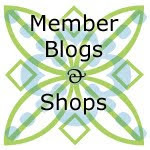 Fons and Porter, in their book "Quilter's Complete Guide" have formulas to determine how to figure out how much fabric to buy for bias binding, and then a cool way to make the continuous strip. Pages 94-95. It amazes me how one can get so much binding out of a relatively small piece of fabric, with no waste!